The Roda (pronounced HOH-dah) is a circle formed by capoeiristas and capoeira musical instruments, where every participant sings the typical songs and claps their hands following the music. Two capoeiristas enter the roda and play the game according to the style required by the musical instruments rhythm. The game finishes when one of the musicians holding a berimbau determine it, when one of the capoeiristas decide to leave or call the end of the game or when another capoeirista interrupts the game to start playing, either with one of the current players or with another capoeirista. 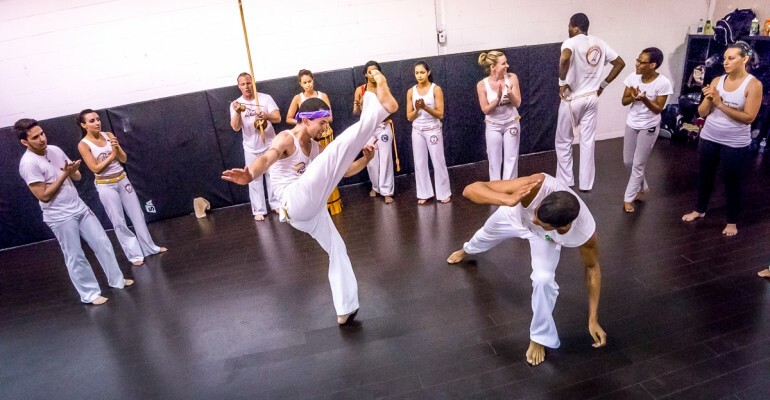 The game of Capoeira takes place in a circle known as the “Roda”, which is created by students, participants and onlookers of the game. The roda is not only considered a microcosm which reflects the macrocosm of life and the world around us, but also defines the physical space where the game is to be played. The entry point to the roda is marked by the berimbau or berimbaus, which may be accompanied by other instruments such as the atabaque and pandeiro. The people in the circle formation clap their hands to the beat of the music and sing Capoeira songs while players who want to buy into the game must crouch at the foot of the berimbau before entering the roda. Opponents should greet each other by briefly gripping each other’s hands and await the response of the chorus before initiating play. The pace of the game is decided by the pace of the music as directed by the berimbau. In case another player wishes to buy the game, they must get the master of roda’s permission before they can initiate play with another player. In respect of ones comrades and the teacher (or Mestre), one should await the end of the roda before leaving.